Sharing tales about one’s relatives is one of the favorite conversation topics in any country. Such conversations hold enduring value for any person, bringing back recollections of childhood, and can include stories told by parents and grandparents about things and people that are long gone. A person who shares something private with you becomes easier to understand, and you also feel closer to him or her. If this is true, then those in Hollywood should be very close to any Belarusian’s heart and vice versa! 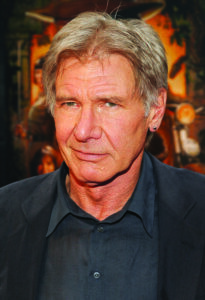 Take, for example, the movie star Harrison Ford, famous for his roles in the Indiana Jones and Star Wars franchises. His maternal grandparents came from Minsk, the capital of Belarus. As a descendant of Belarusians, Sean Penn is one of the few actors to pick up awards at all of the world’s largest film festivals and award ceremonies. This two-time Oscar winner and the owner of Best Male Role awards at the famous film festivals in Cannes, Berlin and Venice is rightly considered one of the world’s most successful actors. Beautiful Scarlett Johansson – Hollywood’s hottest female star – often shares information about her Belarusian roots with interviewers and promises to visit the Belarusian capital soon. Distinguished actor Michael Douglas has been a member of the Hollywood Olympus for several decades. His father, Kirk Douglas, and their relative Cameron Douglas also had successful film careers. This celebrated Douglas dynasty is partly from Belarus as well. We consider Emmy award winner Lisa Kudrow, who became famous after playing Phoebe Buffay in one of the world’s most popular TV shows, Friends, our relative as well. And let’s not forget about Oscar award winners Gwyneth Paltrow and Walter Matthau either! And it’s not just about actors in Hollywood! The Academy of Motion Pictures, Arts and Sciences and the Oscar ceremony were the brainchild of Minsk-born Louis Burt Mayer (1884 – 1957). 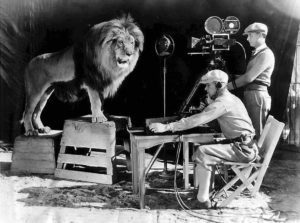 He was also the founder of Metro-Goldwyn-Mayer studios. The Belarusian town of Białystok was the birthplace of eminent American cinematographer and two-time Oscar winner Boris Kaufman (1906 – 1980). Belarusians also see their relatives in the four Warner brothers, who established the world-famous Warner Brothers studios. And what about movie directors in Hollywood? Belarusian ancestors can be found in the family trees of both Steven Spielberg and Sydney Pollack. Furthermore, who would even watch movies if they didn’t have a TV set at home? And how could TV exist without a well-developed radio industry? That’s right. Another native of Belarus helped pioneer radio and TV, and his name is David Sarnoff (1891 – 1971). He was directly involved in installing wireless communication devices in sea vessels and equipping railroads with radios. Later, American audiences were given the opportunity to watch the huge, colored world right through their TV sets, installed in their living rooms. Music is an inalienable part of film. Brilliant musicians – composer George Gershwin (1898 – 1937) and violin virtuoso Yehudi Menuhin (1916 – 1999) – could share their stories of Belarusian relatives who lived in various shtetls, or Belarusian towns with large Jewish populations. Belarusian immigrant Irving Berlin (1888 – 1989) was behind the first Broadway shows and musicals. After World War I, Berlin opened his famous Music Box Theater in New York City. Belarus has also made a sizeable contribution to American show business. 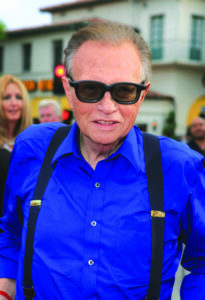 The widely popular American TV host Larry King also has Belarusian connections. those to the film industry. Let’s tick them off, shall we? 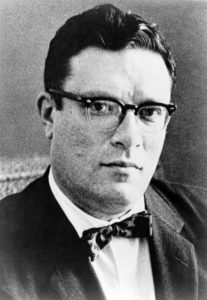 American writer Isaac Azimov (1920 – 1992) was one of the world’s best science fiction writers. Azimov was especially unique because he combined many literary styles and subjects in his works: crime stories, humor, astronomy, genetics, chemistry, history and others. He was also the father of new words such as robots, robotics, positron and psychohistory. Playwright Leivick Halpern (1888 – 1962) from the Igumen shtetl was a descendant of Belarusian emigrants. Former executive editor of The New York Times, Abraham Rosenthal (1922 – 2006), also had Belarusian ancestors. The same could be said for the king of American print media, Samuel Newhouse. 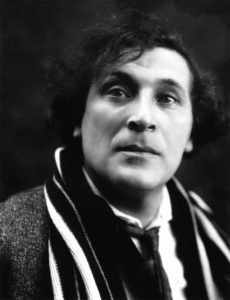 World-famous artist Marc Chagall (1887 – 1985), who was born in the Belarusian town of Vitebsk, lived and worked in the U.S. for seven years (1941 – 1948). One of the most talented painters and graphic artists of the 20th century, Savely Sorin (1887 – 1953), also worked in America. If we look at the world of fashion, we will find the shining star – designer, entrepreneur, knight, one of America’s richest people – and hereditary Belarusian, Ralph Lauren. Perfumer Sophia Grojsman, a Belarusian-American, is also well-known. A cosmic train runs from the stars of fashion and film to open space. World-famous Belarusian scientist Barys Kit spent 25 years working for the American rocket industry. As a mathematician and systems analyst, he took part in the development of the most important space programs: the Apollo missions, the Moon landing, and construction of the Space Shuttles. In addition to Pinsk native Simon Smith, there have been other scientists with Belarusian roots – Sheldon Glashow, Alan Heeger and Martin Lewis Perl – all of whom had the honor of winning the Nobel Prize. And that’s not all! Other Nobel laureates with Belarusian relatives include physicists Richard Feynman (1918 – 1988), Jerome Isaac Friedman and Frederick Reines (1918 – 1998). Former Microsoft boss Steve Ballmer has Belarusian roots. One of the founding fathers of modern internet, Paul Baran (1926 – 2011), and outstanding scientist and successful entrepreneur Felix Zandman (1928 – 2011) were both born in Belarus. One of America’s multimillionaire oil and gas developers, Jack Grynberg, also hails from Belarus. Truly, America’s Belarusian relatives are immensely talented! History shows that America’s technological, cultural, social and scientific development is the result of the labors of many generations of Americans, who worked for the good of their country. But the United States is unique in that its people are immigrants, who brought their talents to their new homeland and turned their ideas into reality. walks of life and all kinds of nationalities. The magnificent Belarusian flowers of this bouquet embellished all spheres of human activity. Even the most important period in the history of the United States – the fight for independence – saw Belarusians take part. Specifically, Tadeusz Kosciuszko (1746 – 1817), was the national hero of Poland, Belarus and the United States. In 1776, Benjamin Franklin appointed Kosciuszko to oversee the engineering activities of the Continental Army. Thanks to Kosciuszko’s military talents, the American army won one of the most important battles of that war in 1777, which went down in history as the Battle of Saratoga. Kosciuszko was given the Eagle of the Society of the Cincinnati and promoted to brigadier general by Congress. One of the seven American monuments to Tadeusz Kosciuszko can be found in Washington, D.C., not far from the White House. This hero’s museum is in Philadelphia, and the New York City subway has a Kosciuszko Street stop at the BMT Jamaica Line. them are the Attorney General Michael Bernard Mukasey, Secretary of Homeland Security Michael Chertoff, Deputy Secretary of Treasury Stuart Eizenstat, labor union leader David Dubinsky (1892 – 1982), and former NATO commander and presidential candidate, retired General Wesley Clark. Together with the U.S., Belarus is proud of its relationship with famous chess player David Yanofsky (1925 – 2000), New York City mayor Michael Bloomberg, U.S. Congressman Sam Gejdenson, the Attorney General of New York Eliot Spitzer, and many representatives of the U.S. legislative branch. One could go on and on, cataloguing Belarusian-American relatives. What’s important is that the memories of these people are alive, that people still have this feeling of love and gratitude towards their roots. Belarusian-Americans, having moved in time and space, remain Belarusian in spirit.